U.S. Customs and Border Protection (CBP) faces many challenges. They are “America’s first line of defense,” and they must vet all individuals entering the United States, 77.5 million of which were non-resident visitors in 2015, according to the International Trade Administration. The vast majority of these people are not a threat, but they still must be adjudicated. CBP’s charge is to manage, control and protect U.S. borders at and between ports of entry. And they must keep terrorists and terrorist weapons out of the country while also enforcing hundreds of U.S. laws. Their job facilitating trade flows and increasing economic competitiveness must not be ignored. That is why I recently obtained nationwide CBP customer service data from 2013 through July 31, 2016 through a Freedom of Information Act (FOIA). I wanted to examine the challenges CBP faces across U.S. ports of entry, and specifically, at air ports of entry. Pouring through the data, however, I was curious how CBP customer service fared at a sea port of entry. 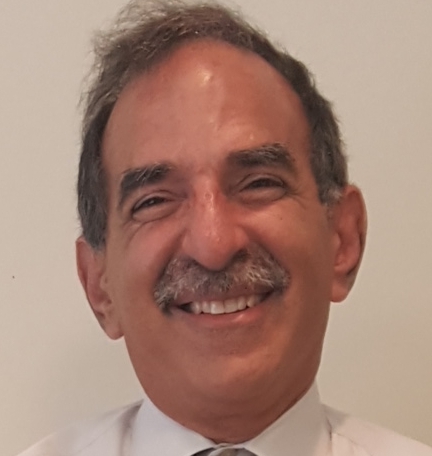 As a case study, I chose Cape Canaveral, Florida, since a large portion of the service provided by CBP at this port deals with cruise ship passenger arrivals. Port Canaveral is ranked as the world’s second busiest cruise port in multi-day embarkations. They market themselves as the closest port to Orlando and Central Florida theme parks and attractions. Orlando welcomed a record 66 million domestic and international visitors in 2015. The table below shows responses by type for 2013 through 2016. For the 3 years, 2013-2015, CBP received a total of between 6 and 16 responses each year at national headquarters. Breaking down these totals, CBP received 4 compliments out of a total of 11 responses in 2013. CBP also received 1 compliment out of a total of 6 responses in 2015. These numbers of compliments should be not be considered out of the ordinary. In 2015, CBP received 1,266 out of a total of 6,936 responses to the CBP customer service center. For 2016, CBP (though the end of July 2016) received 1,470 out of a total 11,084 comments. The most significant comment/issue compared to all complaints/responses is with regard to employee conduct. 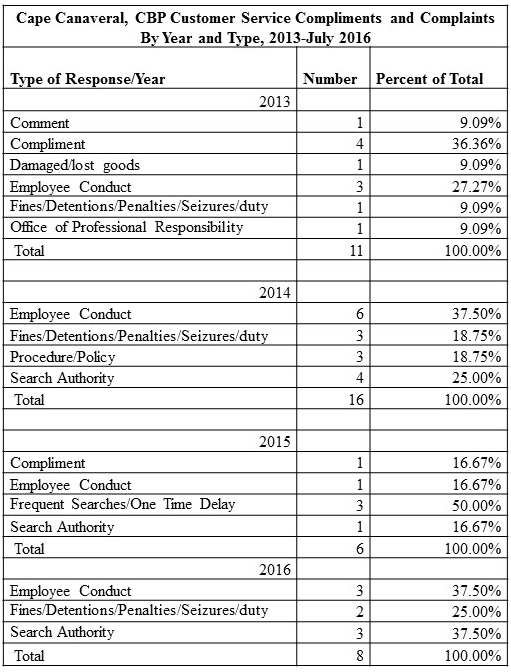 Except for 2015, CBP received a relatively large number of comments for “employee conduct.” In 2013, 2014, and 2016, complaints regarding “employee conduct” were 36%, 38%, and 38% of the total comments received, respectively. In sum, it appears that “employee conduct” by percentage at Cape Canaveral is a major issue, which is similar to other U.S. ports of entry. Just because the relative percentage is smaller at Cape Canaveral than it is across the United States in general does not necessarily mean that there is little to worry about in terms of customer service at this port. Regardless, CBP should continue to focus on ways to improve employee conduct so the relative percentage of these types of comments decreases from being one of the most pervasive types of complaints to one of the least pervasive types.